Millionaire GO! is Lottoland's instant lotto betting product, with a fresh draw on the hour, every hour! Just like Europe’s biggest lottery, it's a 5+2 game format and whatever the jackpot is, we'll match it! Best of all, if you don't match a single number, you'll get your money back. What's not to love?! Simply pick five numbers from 1 to 50 and two extra numbers from 1 to 12, or select the QuickPick option (Quick+1). After this, just click "submit" to proceed to the checkout. You can bet on the outcome of this exciting draw for just £2.50. If you would like to choose an extra QuickPick, you can click on "Quick+1". To select a QuickPick for every line on the betslip, click on "Rest". If you wish to delete and restart your bet, you can do so at any time by clicking on the dustbin icon in the top right of the betslip. A system bet on Millionaire GO! allows you to choose MORE than the standard 5 required main numbers when selecting your bet. Since a single line bet on Millionaire GO! always involves 5 main numbers, the various 5 number combinations of all the numbers you have chosen will all be submitted as bets. That's 21 line bets in total! Additionally, you can also choose MORE than the standard 2 required extra numbers when selecting your bet. Since a single line bet on Millionaire GO! always involves 2 extra numbers, the various 2 number combinations of all the numbers you have chosen will all be submitted as bets. If MORE than the standard 5 required main numbers are selected as well, they will be combined in turn with previous combinations. To create a system bet, simply click on any additional numbers you would like to bet on, and the feature will be automatically activated. You will also be able to see the number of line bets about to be submitted by clicking on the info button next to your stake. How many bets can I purchase? On a single bet slip, you can purchase up to 6 line bets or system bets. How many draws can I enter with one bet? You can submit your bet for the following 1, 2, 3, 4, 5, 10, 12 or 24 draws. You can select the first draw you would bet on by selecting the desired date and time from the “Next draw time” drop-down menu. Once you have selected the first draw you would like to bet on, your bets will be placed for each and every consecutive draw as per the number of draws you have selected. Just like many of the quick-play lotteries around the world, the exclusive to Lottoland Millionaire GO! draw is based on a verified random number generator, independently audited and by an approved Test House authorised by the Gambling Commission. The draw picks 5 numbers from 1 to 50 and 2 extra numbers from 1 to 12, on the exact hour, every hour. The hourly draws take place 24 hours a day, 7 days a week. The jackpot is won when a player's bet matches all five main numbers and the two extra numbers. Is there a possibility I could share the jackpot? There is no guarantee that you will be the only one to choose a given set of numbers. Therefore, if both you and another player are lucky enough to match the corresponding numbers for prize tier 1, you will share the prize fund equally. A reduction in RTP would be realized if more than one person share the top prize, depending on the number of persons sharing it. However, the reduction can never be more than 4%. The amount eligible is determined by the eligible full top prize, divided by the number of tier 1 winners. The Millionaire GO! 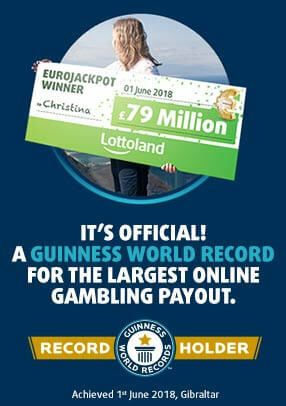 jackpot is based on the estimated jackpot of Europe’s biggest lottery. Every hour, Millionaire GO! will match whatever the current jackpot of Europe’s largest lottery is for the next draw, either Tuesday or Friday. Whilst Europe’s biggest lottery draw result is being established, we will continue to offer the same jackpot value. A single line bet costs just £2.50. During boosted jackpot promotion periods, Lottoland reserves the right to increase the cost of a single line bet. What is the return-to-player (RTP)? The theoretical Return to Player (RTP) based on a jackpot of £14m is 61.02%. Why should I bet on Millionaire GO!? Millionaire GO! offers a chance to win a jackpot equal to the jackpot of Europe’s biggest lottery from just a £2.50 bet. With a new draw on the hour every hour, there's no waiting around until Tuesday or Friday night. Best of all, even if you don't match a single number, you still win your money back! What will happen in the event of a technical fault? In the event of any technical fault (such as system downs and disconnections), all draws due to take place during the fault will be determined as soon as the system is restarted. No draws will ever be cancelled, just determined at a later point. If the lottery happens to be offline, the player will be informed with a pop-up message and the bet will not be submitted. Lottoland is licensed and regulated by the UK Gambling Commission for customers in Great Britain. This product is offered under Lottoland's combined remote operating licence number: 000-038991-R-319408-008 which allows the provision on facilities for virtual event betting. Is Millionaire GO! endorsed by Camelot or part of the National Lottery? No, Millionaire GO! is a virtual lotto betting game offered exclusively by Lottoland and is not connected to, approved or endorsed by the National Lottery or Camelot UK Lotteries Limited.